The coach lights originally installed by Pulte used a total of four bulbs. Two in each fixture. The new coach lights, that are currently being installed, use a total of six bulbs, three in each fixture. Hence it will be necessary for each homeowner to purchase and install the additional bulbs in the new light fixtures. Ron Nay found the lights to the left at Costco. 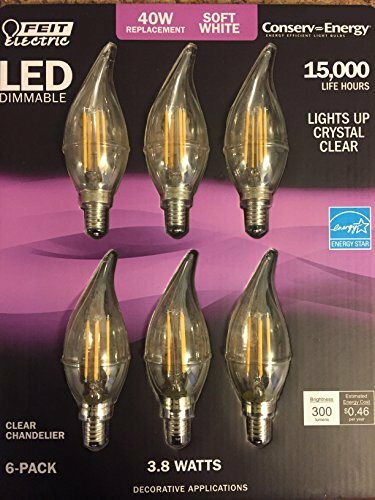 They are Feit – LED E12 Soft White candelabra chandelier Dimmable light bulbs 40w. They are normally $14.99 for a package of 6 but were on sale for $9.99. We are not sure if they are currently available at Costco, as we were not able to find them on their website but they may still be available in the store. However, they are also available at Home Depot or you can order them on Amazon by following the link here.